Despite the constant requests for help and questions regarding everything ranging from space travel to dinosaur poop, we love our kids. The amount of joy we feel far surpasses the cups of coffee we consume to make it through our days. 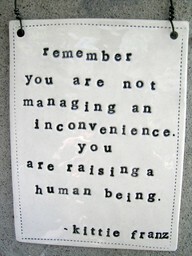 Inconvenience isn't bad. I love to watch my son's face when he digs up a worm. Yep, it means he is covered in mud, but I love discovering the world through his eyes. This quote is a nice reminder for me on the days that I get small minded. When I see my kids as another outfit I have to wash and another picky eater to please. The cartoon above is funny, but this is what it it is all about.